Thanks to Dr. Koteeswaran Govindaswamy, Mahatma Gandhi Medical College and Research Institute (India) for contributing this case and discussion. To contribute a Case of the Week, follow the guidelines on our main Case of the Week page. Register for our upcoming Dermatopathology Course being held this June in order to learn the latest issues and tools affecting your practice this year. Register by April 25 and receive $100 off the regular-priced tuition! Our world-renowned faculty include, Dirk M. Elston, M.D. (Course Director), Steven D. Billings, M.D., Yadira Hurley, M.D., and Melissa Piliang, M.D. This course is one not to be missed! Space is limited so register now! (1) We had a great experience at USCAP 2016. Thanks to all who stopped by our booth - we enjoyed speaking to you, as well as receiving your comments, feedback and new ideas which will be discussed and implemented in the near future. Visit our Blog or Facebook page to share in our experience! (2) Increase exposure to your publications which are particularly useful to practicing pathologists by emailing NatPernick@gmail.com your extra pictures, which will be posted to the appropriate topic with a link to the article. (3) We have added two subcategories to the Chapters on the Mobile Home Page - Neuropath (for CNS nontumor and tumor) and Other (for Cytopathology, Drugs of Interest to Pathologists, Forensic Frozen Section and Pediatric). Now all chapters can be accessed from this menu. 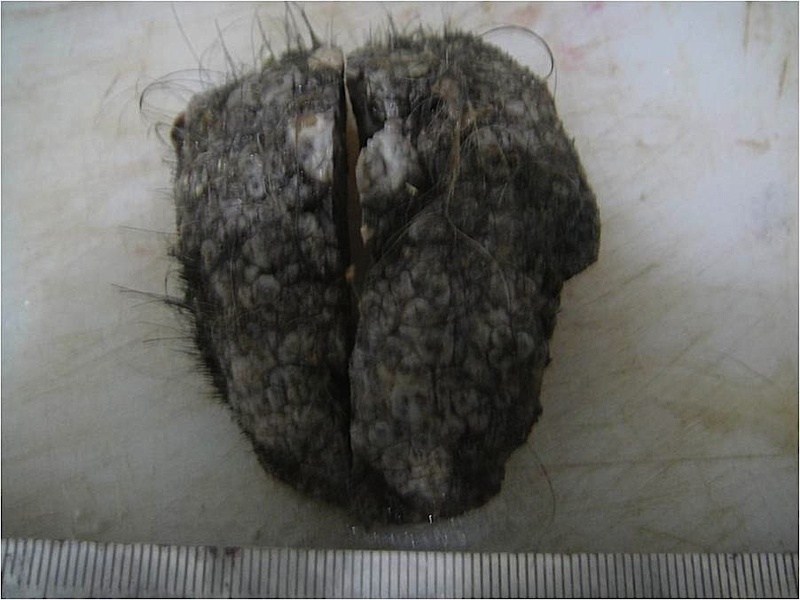 A 32 year old man had an 8 cm scalp mass excised. It was present at birth as a small nodule, but had recently grown and was suspicious for malignancy. The specimen was a skin covered mass measuring 8 x 3 x 1.5 cm. The entire skin surface was studded with nodules of 0.5 to 1.5 cm. The cut surface showed a partial black discoloration. The surface epidermis shows broad pseudopapillary nodules with marked hyperkeratosis and a flattened epidermis. There are nevus cell clusters in the lower epidermis with melanin pigment representing the junctional component of a nevus. 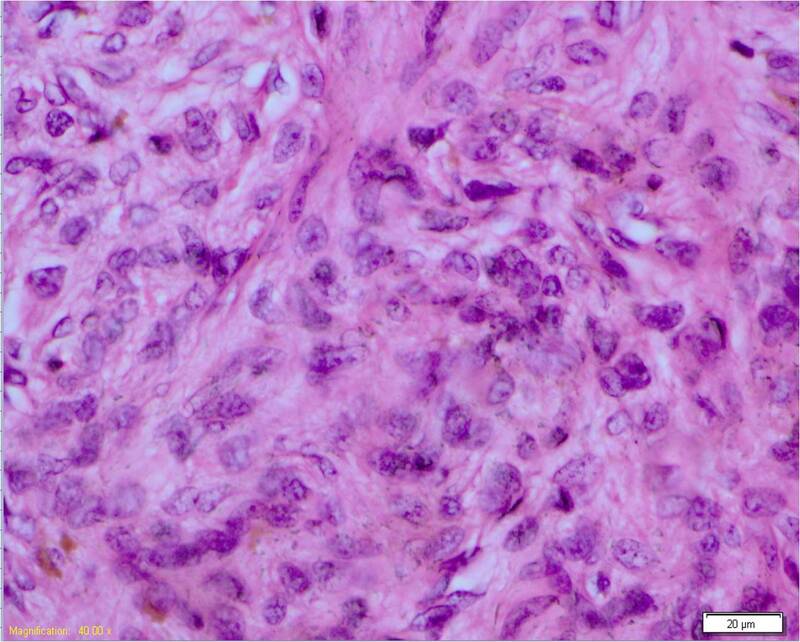 The dermal component shows nevus cell clusters in a nested pattern. 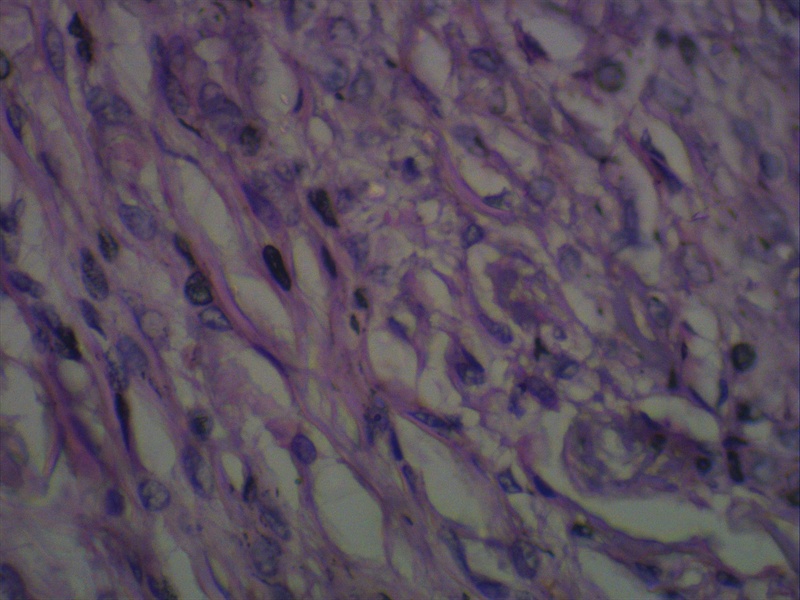 Other parts of the superficial and mid-dermis show a diffuse infiltrate of round to polygonal cells with scant cytoplasm, regular round nuclei and melanin pigment. 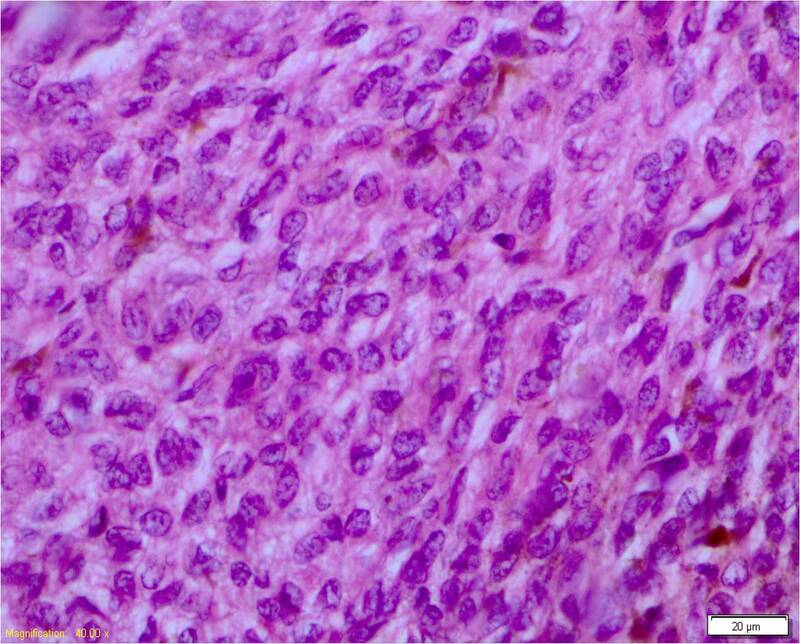 There is a maturation sequence of nevus cells with spindle shaped neurotization in the deeper dermis. 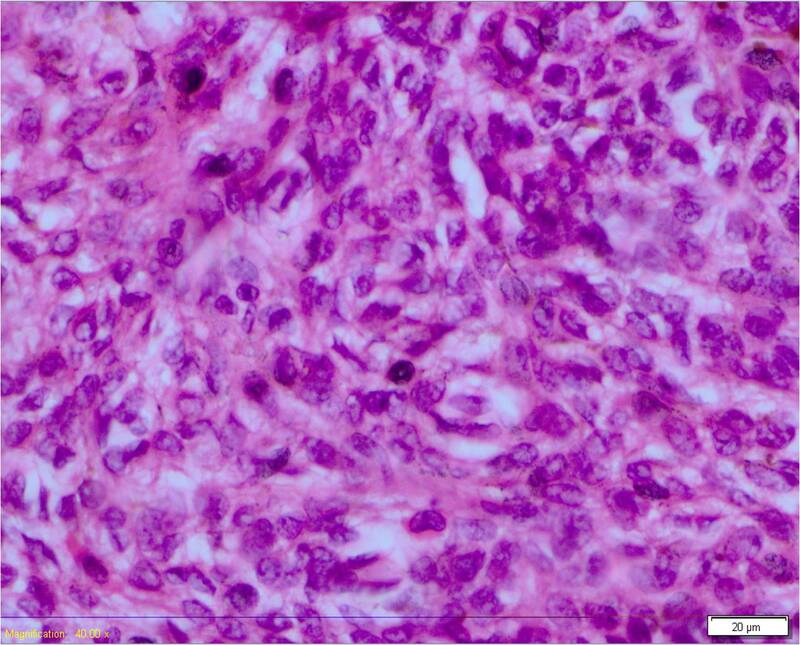 The nevus cells are seen closely around the adnexal structures in a congenital nevus pattern. There is no mitosis or necrosis. 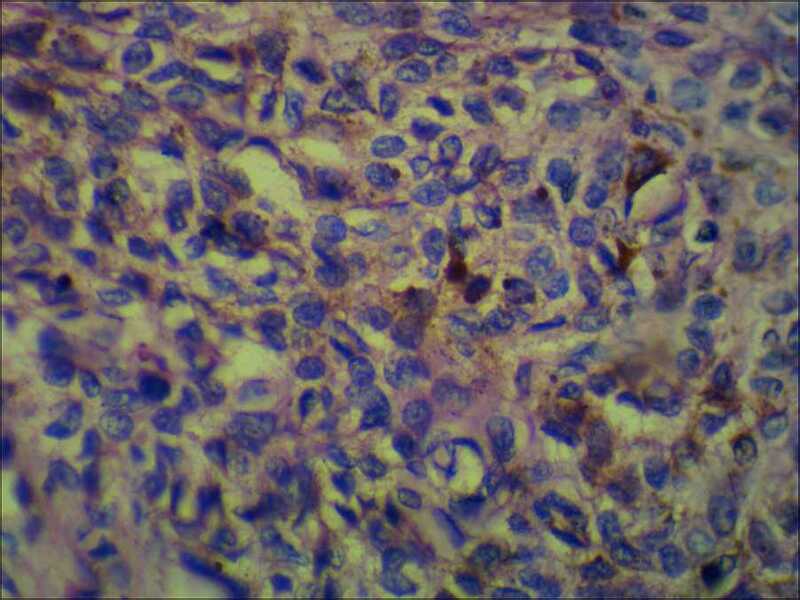 The deeper margin areas show no lymphoid infiltrate. Congenital nevi are found in roughly 1% of newborn infants. They are usually solitary with a predilection for the trunk, but the scalp and extremities may also be involved. Congenital nevi are classified by size: small nevi are < 1.5 cm in diameter, medium are 1.5-19.9 cm and giant congenital nevi are defined as > 20 cm. Congenital nevi usually grow proportionally with the child, though some may become smaller and even disappear with time, while others become darker and hairy, particularly around the time of puberty. Nevi that develop later in life with clinical and histological characteristics of congenital nevi are often referred to as congenital nevus-like nevi, and are likely considerably more common than true congenital nevus (Weedon's Skin Pathology, 2015). 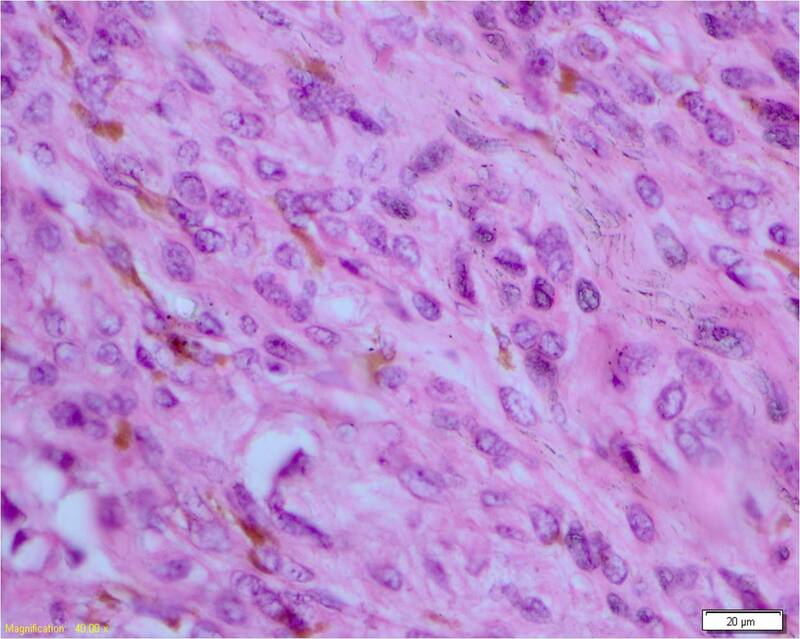 Histopathology shows either a junctional, compound or intradermal proliferation of melanocytes. 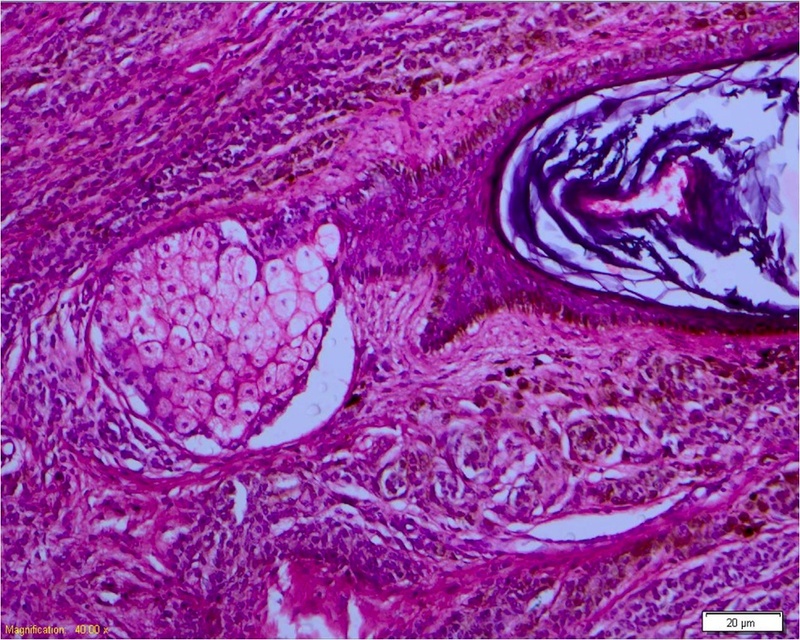 Extension of nevus cells between collagen bundles and around nerves, vessels and adnexae are characteristic features. 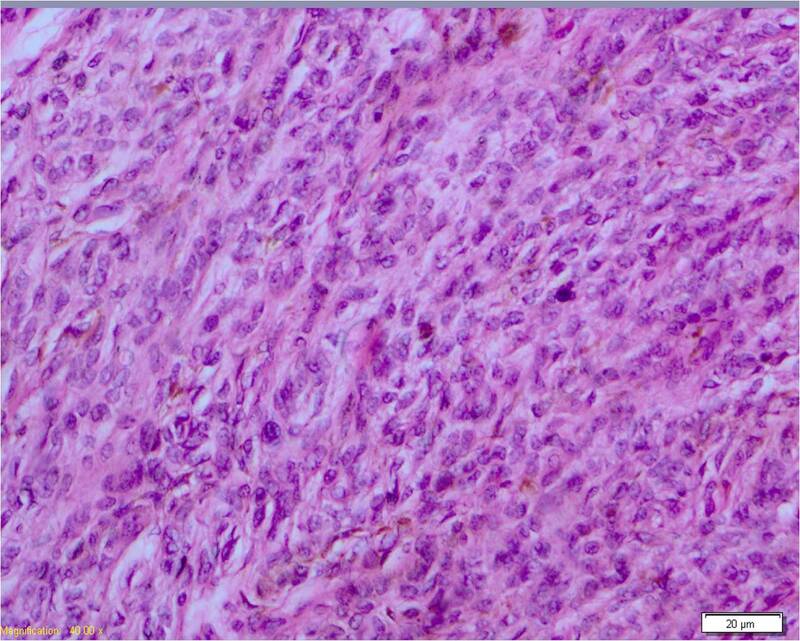 Involvement of eccrine glands and septa are said to be the most specific features of a true congenital nevus (Weedon's Skin Pathology, 2015). The nevus cells are cytologically bland, demonstrating smooth nuclear contours and fine chromatin. Intranuclear pseudoinclusions may be seen. 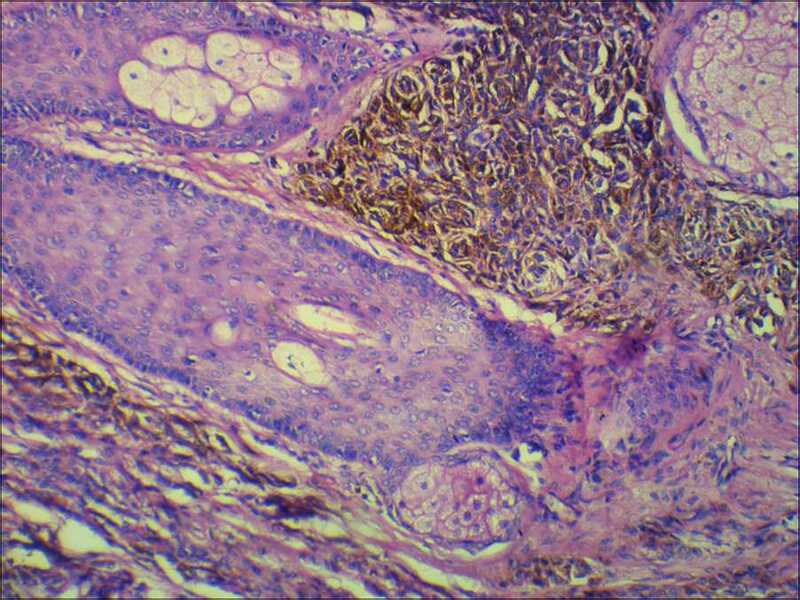 The melanocytes become smaller, or mature, with descent into the dermis and mitoses are rare. Congenital nevus cells tend to involve collagen bundles in the deeper layers of the skin more than is the case in acquired nevi (An Bras Dermatol 2013;88:863, Dermatology (3rd edition), 2012). The risk of developing melanoma in small to medium sized congenital nevi is controversial. One large review study of 6571 patients found an overall risk of 0.7%, dependent on the size of the nevus (Weedon's Skin Pathology, 2015). In giant congenital nevi, lifetime risk of melanoma is estimated at 5-10%, with 70% of melanomas diagnosed by age ten years (An Bras Dermatol 2013;88:863, Australas J Dermatol 2009;50:231). 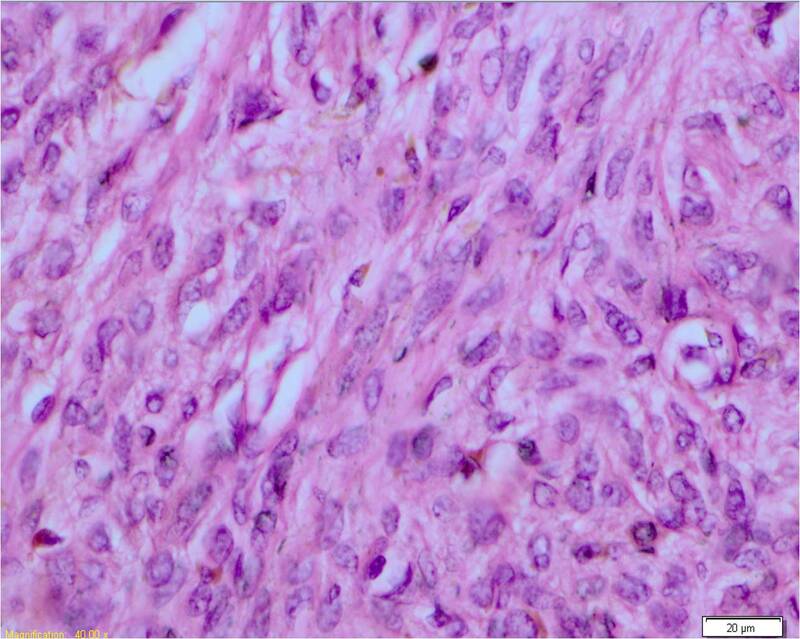 In these cases, the prognosis is generally unfavorable due to the deep origin of the tumor, rendering it more difficult to detect on clinical examination and resulting in a later stage at presentation. Congenital nevi, especially giant nevi, can also be associated with several syndromes, including Carney syndrome (including LAMB and NAME), epidermal nevus syndrome, neurofibromatosis type I and others. Treatment of congenital nevi often includes primarily clinical observation, but the age of the subject, the lesion size, the location and depth and the risk of developing malignant change within the lesion must be taken into account to guide management. 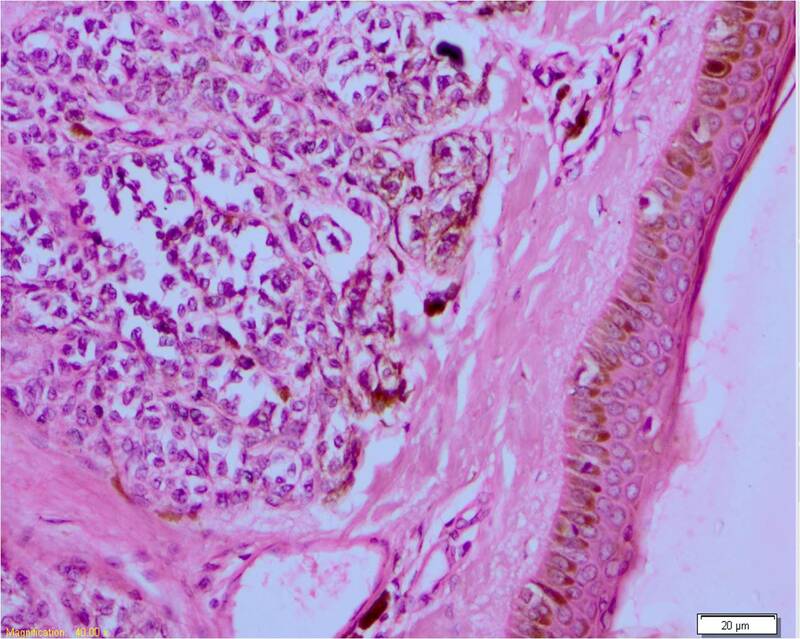 If worrisome features are present, the lesion is surgically excised and sent for histopathologic examination. Discussion edited by Dr. Jennifer R. Kaley, University of Arkansas for Medical Sciences (USA).